Update on Rosa Katzenstein Katz and Her Family! Just a quick update on the family about whom I posted today. 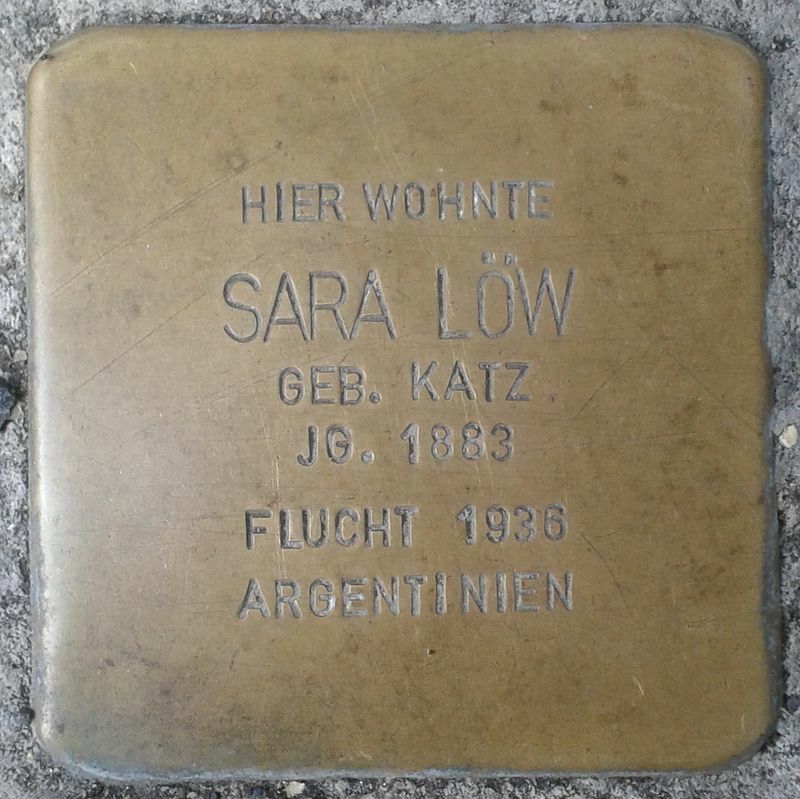 My dear friend and brilliant researcher Aaron Knappstein located Stolpersteine in Selters for Rosa Katzenstein Katz, her daughter Sara Katz Loew, and Sara’s husband Otto Loew. 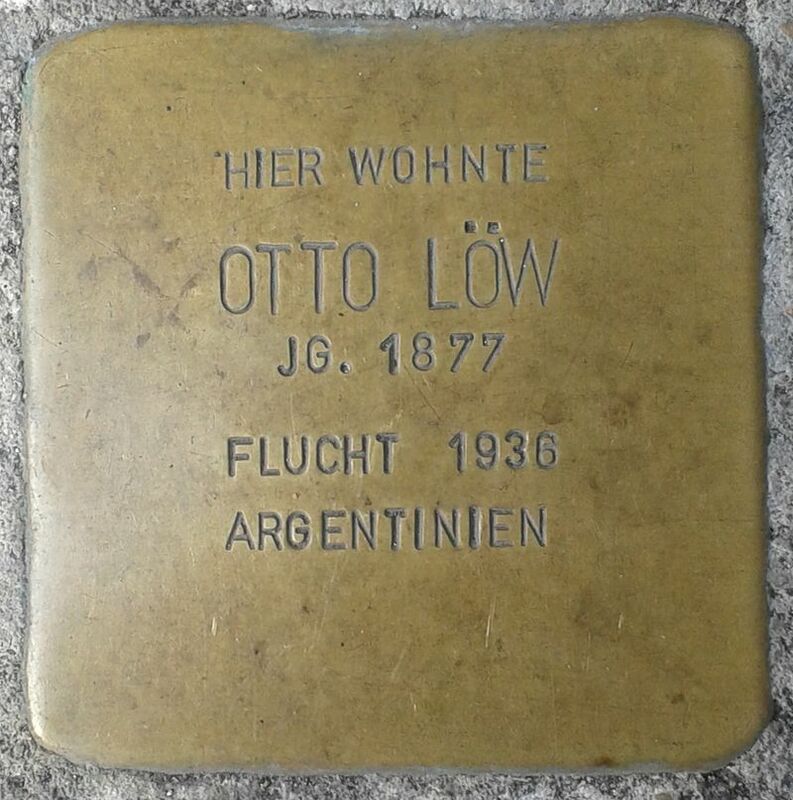 And the good news is that these are not Stolpersteine for people killed, but for people who escaped—to Argentina in 1936. Thank you SO much, Aaron! Now I will see if I can find anything about their lives in Argentina. Further update: A search of the JewishGen Online Worldwide Burial Registry turned up burial records for Rosa and for her daughter Sara. Sadly, neither lived very long after escaping to Argentina. I did not find Otto there so perhaps he left Argentina after Rosa and Sara died. FURTHER UPDATE! 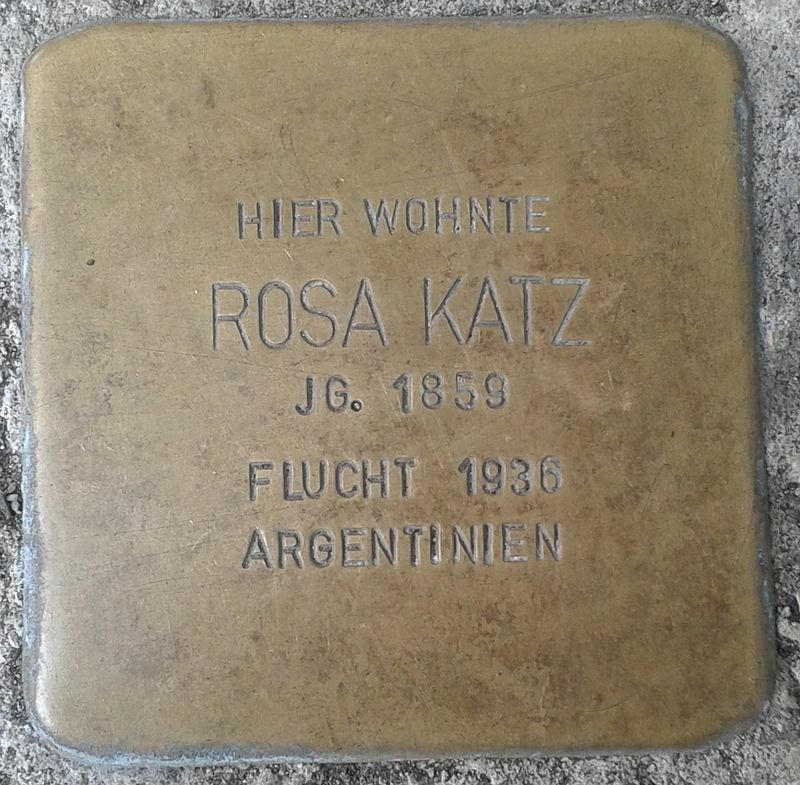 Well, from Aaron Knappstein’s discovery of the Stolpersteine, I now have found not only where Rosa and her daughter Sara died and are buried; I’ve also found Rosa’s daughters Sophie and Recha and their husbands. They all ended up in Buenos Aires and are buried in the same cemetery. Aaron, you knocked down a big brick wall with one blow! This entry was posted in Germany, Holocaust, Katzenstein and tagged Germany, holocaust, katzenstein by Amy. Bookmark the permalink. Hi, Amy. You might want to try the immigration records and passenger lists for Brazil as well. Some of my family escaped to Argentina and many have immigration cards for Brazil. They are available on FamilySearch and Ancestry. This is the FamilySearch Wiki for Brazil with links to their records https://www.familysearch.org/wiki/en/Brazil_Emigration_and_Immigration If you find someone in the immigration card records, page forwards and backwards. The second page often has info on where they “landed” when they left Brazil. Only the first card in the record is indexed and they are in “mostly” alphabetical order. Names have been modified. Sigfried becomes Sigfredo, etc. Most cards list parents, which makes it easy to determine if you’re looking at the right person. There is also a Wiki for Argentina with tips and links: https://www.familysearch.org/wiki/en/Argentina_Genealogy So excited that you got some good news!!! Thank you so much, Barb! I have found some of these before for other family members, but unfortunately not for this group. However, I did just search the JOWBR and found that Rosa and her daughter Sara both are buried in Buenos Aires, Sara in 1937, her mother Rosa in 1940. So at least I have some closure. Thank you again!! Love the fast action of one update followed by another. You have a wonderful group of readers/researchers following you and your families’ stories. I do! I am so fortunate to have found such a wonderful community—of which you are a part! Hi Amy, So pleased you have located the family. I looked in the British records as the name was sometimes changed (anglicized) to Lowe but nothing seemed to match up for the years of birth. Glad you could tie up those loose ends. Wow, wow, wow! What a great discovery and I’m so glad you found them. I hope one day I can break down my brick wall and if I find others in the rubble, that will be quite a bonus! Well, what I have learned is that two heads (or 200 heads) are better than my one head and that fresh eyes see things that my tired eyes miss. So ask for help! Wow, to have such closure so quickly is really a gift. The most important thing is that they all got out. However, I would think that memories of friends and relatives who did not would always remain a great concern. I agree—whether killed or not, whether in a camp or not, all Jews who were deprived of their rights, forced to leave home, and lost friends and family and homeland were scarred forever in some way. Exactly. And we must never forget or let the world forget. Fabulous! I can sense you jumping for joy. 🙂 Yay for another brick or two knocked down. Amidst the unbearable pain of those who were killed, it’s wonderfully heart warming to read of those who escaped. I often wonder as well about people during times of horrendous fires who were forced from their homes and what became of them. We often don’t know where to begin looking for a trace of them, either. 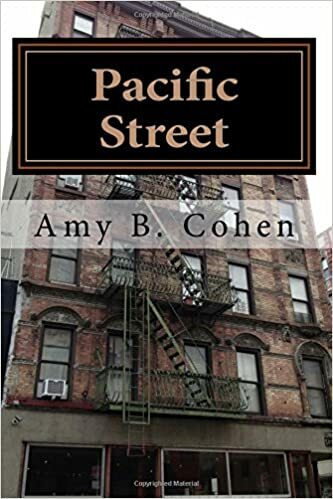 Great finds, Amy. Yes, this has been a nice reprieve, but more sad news ahead, I am afraid. Thanks, Karen. Thanks—I needed a few happy endings to get me ready to write the ones to come.